This is the first of a five-part series on my experiences and observations of the 58th Inauguration for President of the United States. The other posts will be: A quiet calm before the storm | From a sea of Red to oceans of Pink | Good intent gone very wrong | Escape from D.C.
From the moment I arrived into Washington D.C. you could sense it as soon as you stepped into the terminal from the jet. 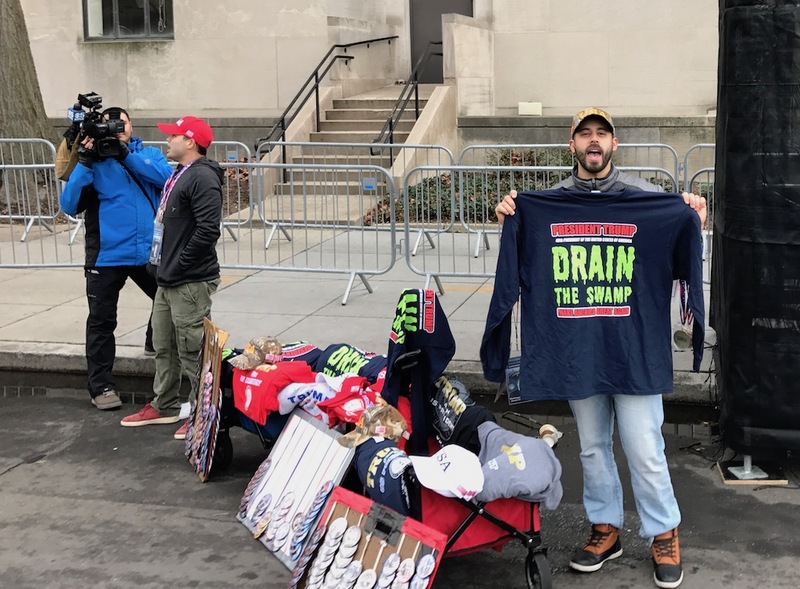 People were smiling, the stores were fill with Inauguration souvenirs and there were red hats. I met up with my family at the hotel as they had all arrived already. I then learned that my wife and youngest son not only had the opportunity to be very close to the Tomb of the Unknown Soldier as the future President and Vice-President laid a wreath there in honor, but they got to see and get waves on the way in and out. This was after they got to the hotel to check in to find that the future President and first-lady were there having lunch. My youngest walked within inches of the future first-lady and she said Hi to him. So needless to say, they had a very exciting first day in D.C.
As we got up the next morning and made our way on the metro to our stop to get into the ticket area you could tell that the mood was just super-positive. The red hats, American flags, and smiles were everywhere. What wasn’t everywhere were the protesters. There were a few here and there assembling up like these Sith Lord looking wannabes we saw. The ticket area the surrounding area was awesome with joy and happiness. Even the security people screening the ticket holders were in great moods and smiling. It was like Chik-fil-a was working security. There were vendors selling goods, people cheering, happy, etc. Once in the area people were talking to strangers, getting along great and all there to enjoy the moment. There were Hillary supporters, Obama supporters and of course many, many Trump supporters but all got along ok. When President Obama or Hillary were announced, people clapped for them and nobody yelled at those clapping and screamed obscenities. How many people were there seems to be a question. I can tell you that regardless of what you see in a picture from the media that was taken at 8AM that day, the place was packed. The picture below was taken as soon as the inauguration ceremony ended. As you can tell there are people for as far as you can see. As the Sen Schumer rambled on with topics that were not appropriate for the event, people started singing “Nah, Nah, Nah, Nah….goodbye”. 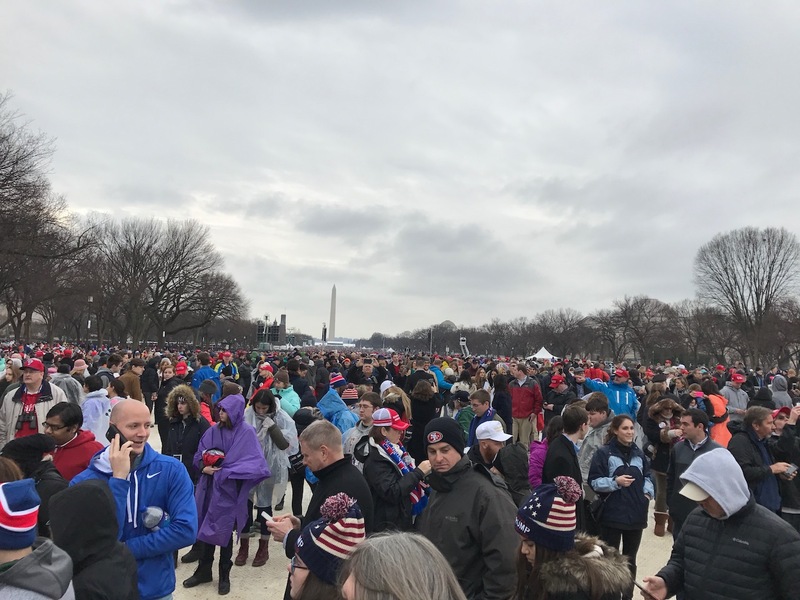 There were ready for him to shut up, which was even more evident as people started to chant “Trump, Trump, Trump” because the were ready for the swearing-in. As the President took the oath, it was like watching your favorite hockey team making the winning goal in the last seconds of game 7, people high-fived, hugged strangers, cheered, clapped and shouted in enthusiasm. It was the highest-point of a weekend of festivities, and that one moment was why so many people spent money, time and disrupted their lives to be there. From the time it ended, through the parade on through the night, there was just happiness everywhere. Yes there were some isolated and well-contained violent riots in the city, but the awesome men and women in blue kept that in check and unless you checked the news on your phone, you had no idea it was going on. Overall it was a great day where Americans came together to celebrate America. This is not my first Inauguration, and I can tell you that besides July 4th which happens every year, the Inauguration is probably the closest event you will ever be part of that is Mega-Patriotic. Coming next is "A quiet calm before the storm"